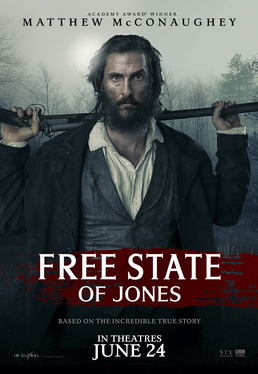 Free State of Jones is a 2016 film chronicling the little-known story of Newton Knight (played by Matthew McConaughey), a white farmer in Mississippi who led an armed revolt by disgruntled farmers and escaped slaves against the Confederacy during the American Civil War. Together, they declare that Jones County, Mississippi and the surrounding region is "the free state of Jones", seceding from the Confederacy. The American Civil War: The film's starting point is the Battle of Corinth in 1862 when it was becoming clear the Confederacy's chances of victory were low. It extends into the post-war Reconstruction period as well. Based on a True Story: Although the specific plot details are fiction, the basics really happened. Composite Character: Moses is completely fictional, and based off of more than one escaped slave that Newt met. Cultural Rebel: Newt and the other white Southerners who rebel against the Confederacy, breaking with the majority. His Aunt Sally is also an abolitionist who helps slaves escape, while Newt comes to oppose slavery as well. Defector from Decadence: Newton Knight, who leads Jones County in rebellion against the Confederacy along with a number of other disillusioned Confederate deserters. Doomed Moral Victor: It's pretty clear to anyone who knows about the events after the American Civil War that the freedmen and white supporters such as Newton Knight will not make out well. For Newt, his "victory" is simply surviving, while former slave Moses is not so lucky. Downer Ending: Although the Free State of Jones manages to hold out to the end when the Confederates lose the civil war and slavery is abolished, former Confederates retake control of the South, murdering the former slaves who try to assert their rights, while suppressing the votes of them and white supporters like Knight. Sadly, truth in television. Enemy Mine: The Free State of Jones tries to make common cause with the Union Army based on this, but get little support. Groin Attack: The Klansmen castrate Moses before hanging him. Karma Houdini: All of the Confederate officers and slave owners get off scot-free, having only to swear loyalty to the United States. Their former nemesis Lieutenant Barbour later becomes a judge, using this office to get former slaves into coerced "apprenticeships" that amount to slavery in all but name. Newt manages to buy Moses' son out of his. The Klan: The KKK is shown during the Reconstruction years, murdering blacks who try to vote or register others such as Moses. Unfortunately they succeed in largely preventing them from voting. Maligned Mixed Marriage: Newt's relationship with Rachel, though technically they were never married. Plus their great-great grandson's, which results directly from the above as he qualifies as "colored" under Mississippi state law, thus barring him from marrying a white woman legally. The Medic: Newt serves as one while in the Confederate Army, but can't save his young nephew. This causes him to desert. Mighty Whitey: Downplayed eventually. While Newt does arm the escaped group of slaves and becomes the leader even when other white Southerners join in, once Jones becomes a free state they decide that they should have no leader. Mixed Ancestry: Newt and Rachel's son Jason. Rachel herself is mixed race too. It's also the issue at Davis Knight's trial as to whether his great-great grandmother was Rachel or Serena Knight. Assuming the former, he would be "colored" under Mississippi state law and thus forbidden to marry a white women. If the latter, he would be white and thus freed. The prosecutor lampshades how unusual this is, as generally it would be the father whose identity isn't clear. Eventually the Knight family Bible is uncovered, revealing that it was Rachel. Off on a Technicality: The Mississippi Supreme Court engineered this to save the state's miscegenation law from a constitutional challenge, overturning Davis Knight's conviction on technical grounds. Real Men Love Jesus: Newt and Moses both appear to be devout Christians, invoking God at numerous points (not unexpected for the time and region). Rebellious Rebel: The film centers on a group of disgruntled white farmers and fugitive slaves rising up to fight the Confederacy, which itself was deemed the "rebels". Jones County, Mississippi secedes from the Confederacy just as the Confederate States did. Slavery Is a Special Kind of Evil: Newt comes to believe this after seeing how the slaves are treated (he doesn't own any himself, like many other poor Southern farmers during that period) and his Aunt Sally helps slaves escape into the swamps. The former slaves naturally agree, with Moses proclaiming that "You cannot own a child of God", to Newt's quiet approval. War Is Hell: Newt firmly believes this after having seen fighting up close, carrying wounded soldiers off to surgery, in contrast with others who believe they fight for honor, and feels that his nephew was killed for nothing. The 4 men getting hung for trying to surrender is a rough scene. As most of them were just kids.